$152.88 - Baxton Studio IDB048-Beige-Full Elizabeth Modern & Contemporary Beige Fabric Upholstered Panel-Stitched Full Platform Bed - 33.46 x 57.09 x 80.51 in. Home Furniture>Bedroom>Beds>Beds Baxton Studio IDB048-Beige-Full Elizabeth Modern & Contemporary Beige Fabric Upholstered Panel-Stitched Full Platform Bed - 33.46 x 57.09 x 80.51 in. Baxton Studio TSF7715-Beige-CC Rayner Modern & Contemporary Beige Fabric Upholstered Swivel Chair - 32.7 x 29.1 x 31.9 in. 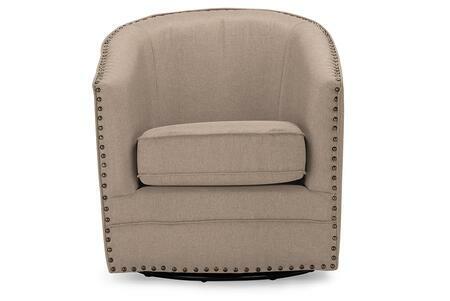 Create a cozy nook in your space with the Rayner swivel chair. Constructed from plywood the Rayner is upholstered in a classic neutral fabric boasting a soft texture as well as resistance to wear and tear. The chair is fitted with a swivel base allowing you to rotate 360 degrees. Channel tufting on the back adds an elegant refined look. This versatile chair is well suited for a living room bedroom or home office. Baxton Studio TSF7718-Beige-CC Micah Modern & Contemporary Beige Fabric Upholstered Tufted Swivel Chair - 27.6 x 29.9 x 29.9 in. Comfortable and compact the Micah swivel chair is an easy addition to any space. Constructed from plywood the Micah is upholstered in a classic neutral fabric boasting a soft texture as well as resistance to wear and tear. The chair is fitted with a swivel base allowing you to rotate 360 degrees. Button tufting and silver-finished studs add an elegant refined look. This versatile chair is well suited for a living room bedroom or home office. Baxton Studio TSF7715-Grey-CC Rayner Modern & Contemporary Grey Fabric Upholstered Swivel Chair - 32.7 x 29.1 x 31.9 in. Baxton Studio CF8747B-Grey-Full Brookfield Modern & Contemporary Grey Fabric Upholstered Grid Tufting Full Bed - 47.05 x 58.66 x 78.94 in. Stay and sleep in comfort with this Brookfield modern and contemporary grey fabric upholstered grid-tufting full size bed. Crafted with style and characters the bed features stylish grid-tufting design which can accommodate a full sized mattress. Fitted with solid wood legs in black the Brookfield provides stability and a stylish headrest. The entire headrest has been upholstered in high quality grey polyester fabric while grid-tufting design gives the piece a touch of sophistication. You'll love having this inside your bedroom. It provides comfort with a touch of delicate retro flavor. Made in Malaysia the Brookfield requires assembly. Baxton Studio Benjamin-Twin-Grey Benjamin Modern & Contemporary Grey Fabric Upholstered Twin Arched Bed with Nail Heads - 53.04 x 42.71 x 79.37 in. Upholstered furniture is an easy yet stylish way to add a touch of luxury to your kid's bedroom or playroom. Benjamin grey fabric upholstered twin size bed features an arched headboard with large silver nail heads trim around the edges of the headboard creating a contemporary and luxury feel in the bedroom. The bed is fully upholstered in grey fabric. Heavily padded with foam the headboard provides a safe shelter to your kids ensuring them the whole night sleep without bumping on the hard headboard. Constructed with CARB-compliant solid rubberwood and MDF slats the bed frame ensures you a piece of mind on the safety issue in regard to lead emission. Made in Malaysia this twin size toddler bed or teen’s bed requires assembly. Baxton Studio Ashley-Beige-Daybed Mabelle Modern & Contemporary Beige Fabric Trundle Day Bed - 37.2 x 43.5 x 95.28 in. A classic design perfected the Mabelle beige fabric upholstered daybed with guest trundle bed is one the most adaptable daybeds and can easily fit into any room in the house. Drawing inspiration from classic sofa designs for its rolled arms button-tufting elements and the nail heads trimming the Mabelle is constructed of a combination of solid wood and MDF. Padded with foam beige linen-like fabric upholsters the frame throughout for leaning comfort. 3-in-1 Mabelle daybed have a twin roll-out trundle so it can accommodate up to two overnight guests. It's a sofa! It's a bed! It's another bed! Elegantly styled with silver nail heads on the side panels the Mabelle will definitely give your living space the sophistication that you are looking for. Perfectly suitable for small bedroom kids' bedroom or teens' bedroom it’s providing additional bed for your kids' sleepover guests. In your living room or family room the daybed could be used as extra sofa seating by throwing couple of throw pillows. Constructed of carb-compliant solid rubberwood the Mabelle assures you on the child safety concerns. Made in Malaysia the trundle bed requires assembly. Baxton Studio TSF7718-Grey-CC Micah Modern & Contemporary Grey Fabric Upholstered Tufted Swivel Chair - 27.6 x 29.9 x 29.9 in. Baxton Studio WA1212-Twin-Beige Paris Modern & Contemporary Beige Linen Upholstered Twin Tufting Bed - 50.9 x 41.93 x 78.39 in. Give your bedrooms a cutting edge feel and look with this modern and contemporary bed. Paris beige linen fabric upholstered twin size bed features cleanliness with tufting effect in diamond shape. Constructed with CARB-compliant solid rubberwood and MDF slats this piece of furniture complies with kids' safety regulations. Heavily padded with foam the headboard provides a safe shelter for you or your kids ensuring the whole night sleep without bumping on the hard headboard. Perfect for growing teens or youths the Paris features low footboard creating an illusion of open space. Solid rubberwood feet in black finishing support the bed frame allowing the bed to stand proud and be the focal point of your bedroom. Underneath the platform it could be a good place to store some books and magazine for your reading at night. The twin size bed is suitable to be placed at your guest bedroom kids' or teens' bedroom or small bedroom. Made in Malaysia the Paris requires assembly. Baxton Studio Parkson-Beige-Daybed Parkson Modern & Contemporary Beige Linen Fabric Curved Notched Corners Sofa Twin Day Bed with Roll-Out Trundle Guest Bed - 36.86 x 42.51 x 83.27 in. The Parkson daybed captures the spirit and popularity of upholstered beds in a space-saving pack. Versatile and sophisticated the Parkson daybed features curved and notched corners with corded interior trim across the back and side panels giving it a classy and expensive look. Constructed from CARB-compliant solid hardwood it's fully upholstered in beige linen fabric with comfortable foam-filled. A contemporary sofa shape that makes it an ideal way to add sleeping spaces around the home the Parkson combines daybed guest bed and sofa in one a multifunctional space saving solution that is perfect for your living room family room guest room or play room. The high wrap-around back and notched arms of our Parkson daybed form a cozy stage for a row of colorful pillows in your favorite fabrics for extra comfort. The Parkson can also function as your kids' or teen's bed at your kids' room. The roll-out trundle can be dressed up with mattress for comfy lounging by day and then has space for friends to sleepover by night. In the home office the daybed is a good for extra seating space during day time while transforming into guest bed for two at night. Made in Malaysia the daybed requires assembly. Siderail: 5.46 High x 77.